I blush to admit that I actually asked the guy to do this. It is the first and no doubt the last time my novel will be connected with Samuel Johnson. Though I hope to get back and have my picture taken with Hodge for my next author photo. This should be fun: I’m on the roster of featured speakers at the Hoboken Historical Museum, as part of its program Driving Under the Hudson: A History of the Holland and Lincoln Tunnels. 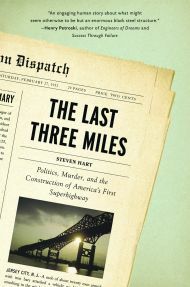 My book The Last Three Miles: Politics, Murder, and the Construction of America’s First Superhighway focuses on the Route One Extension project and the construction of what is now called the Pulaski Skyway, both of which were closely linked to the construction of the Holland Tunnel. The whole project was spurred by the realization that millions of cars would come pouring out of the Holland Tunnel, only to eddy and stall in the decrepit streets of Jersey City and the inadequate roads cutting through the Meadowlands. A key player in the Holland Tunnel story was Jersey City political boss Frank Hague, whose demands for road improvements and fixtures for the tunnel approach contributed to the stress felt by the tunnel’s designer and head engineer, Clifford Holland. There’s more, but we can go into all that on Sunday, June 24, at 4 p.m., which is when I’ll be speaking at the museum. The good people at 3 Quarks Daily are once again hosting a competition to pick the best arts and literature blog posts of the past year. The entries are to be judged by the estimable novelist Gish Jen, and nominations are still open. You can even nominate one of your own posts, which is what I did just now. Damn, I haven’t been back to New Orleans since the hurricane. I need to rectify that, and soon. I’ve thought up a drinking game for Oscar night, and I’d appreciate hearing from anyone else who tries it out on Feb. 26. The roots of the game lie in previous Oscar ceremonies, where the winners of golden guys for the films Forrest Gump and No Country for Old Men managed to thank enough people to fill the Beijing phone directory, but somehow forgot to mention the names of either Winston Groom or Cormac McCarthy. You know, the guys who actually wrote the books that served as the basis for the films that made those Hollywood types so much richer. So on Oscar night, line up your favorite alcoholic beverage, take note of the winners of awards for films based on previously published works, and take a gulp whenever the author of the work gets mentioned. I call it “The First Drinking Game for Teetotalers,” and any day now I expect to get an endorsement from Alcoholics Anonymous. 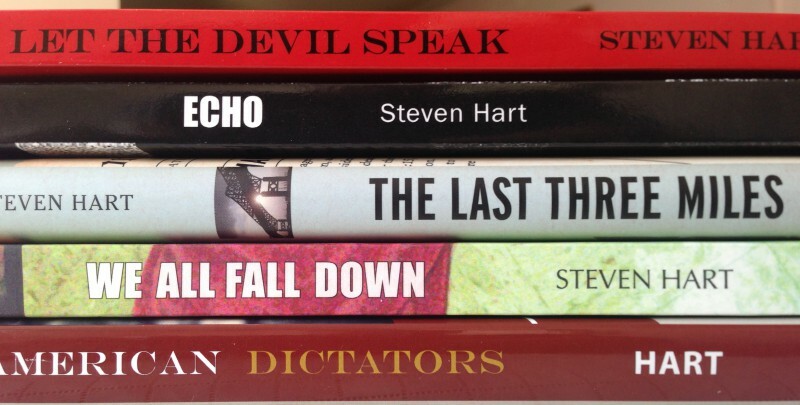 I’ll be giving a talk about We All Fall Down and the writing biz in general on Tuesday, Feb. 21, at 7 p.m. in the Highland Park Public Library, South Fifth Avenue, in — wait for it — Highland Park, N.J. If you people are nice and ask me politely, I may even read a bit from the new novel I’m working on . . . even . . . as . . . we . . . speak. Click here if you don’t get it. I trust the Mitt Romney connection is already obvious. 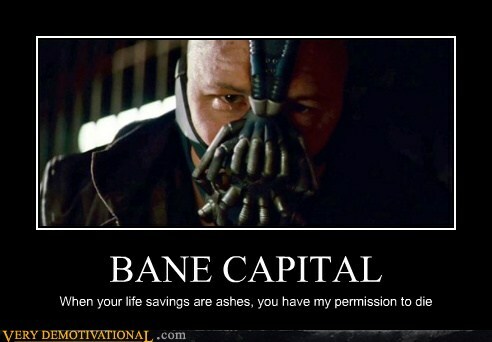 For the record, I really am interested in seeing Tom Hardy’s performance as Bane in The Dark Knight Rises. With The Dark Knight, Christopher Nolan set a pretty high standard for all subsequent Batman villains. A Conservative Martyr is Born, or Soooooo-weeee! Time to Top up the Trough! In today’s Good Riddance to Bad Rubbish news, conservative political hack Karen Handel has quit the Susan G. Komen Foundation because of the continuing firestorm over its decision to cut funding to Planned Parenthood — a move she spearheaded, according to HuffPo. Ms. Handel announced her departure with the clouds of squid-ink that usually darken the waters whenever a winger gets spooked by the spotlight. What does it mean? Here comes another piglet for the Wingnut Welfare trough, that’s what it means. What’ll it be next for our Ms. Handel? A ghost-written book of recycled whining that becomes a bulk-order bestseller? A weekly column for WingNutDaily? A cozy sinecure at an unflushed think tank? Conservatives love their make-believe martyrs, and we haven’t heard the last from this one. For me, the Super Bowl is like a holiday observed by some obscure religion I know very little about. One day I’ll notice people behaving strangely, and then I’ll hear the term “Super Bowl Sunday” and all becomes clear. I have no idea what teams were facing off that particular year, but I remember going to see Kenneth Branagh’s Henry V at the Montgomery arthouse cinema on Super Bowl Sunday and finding the house almost completely sold out. I even spotted Joyce Carol Oates in the audience. They had all said to themselves, “Screw football, I’m gonna go see a Shakespeare film.” My fondest Super Bowl Sunday memory. Every evening, after supper and perhaps an hour or so of television, AJ would fill a thermos with hot coffee, check his tape recorder to make sure the batteries were healthy and there was plenty of tape, kiss his wife, Edna, good night and then get into his car and drive away. Drive where? That didn’t matter because he wasn’t sightseeing. What he was doing, Scheherazade-like, was dictating a new story each night, though instead of into the impatient ears of a threatening sultan it went no farther than a spool of magnetic tape — at least, not until AJ got home sometime in that early morning, dumped the filled tape spools next to Edna’s typewriter and went cheerfully off to sleep. Edna was an excellent typist, so by the time A J shambled into the kitchen for breakfast around early afternoon, the manuscript was ready to be shown to an editor. Now is as good a time as any to restate my opinion that Frederik Pohl’s blog is one of the best writer’s sites to be found on the Intertubes.